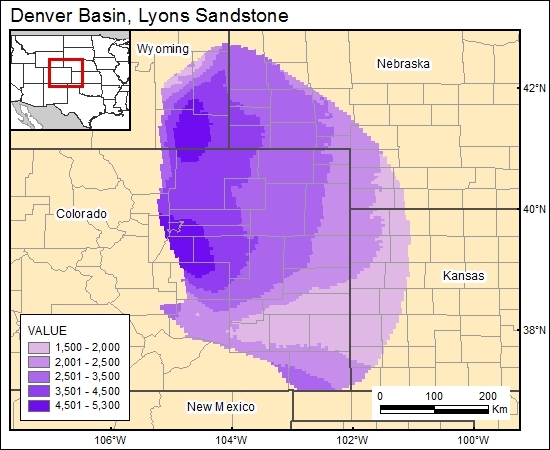 Even though several dip and strike cross sections that include the Lyons Sandstone are found in the literature, one complete depth map of the Lyons Sandstone for the entire basin was not found. The depth map was estimated by using the depth map of the Dakota, as suggested by Garbarini and Veal (1968,p. 176). They mentioned that the depth to the Lyons can be estimated by adding amounts ranging from approximately 700 ft (Apishapa Uplift) and 1,000 ft (central basin) to the Dakota depths. The depth map in GIS shows depths ranging from 2,000 ft to the east to 10,000 ft at the axis of the basin. Levandowski and others (1973) presented structural maps of the Lyons Formation in producing oil fields.